In a continuing effort to expose my students to books that play with format and structure in unique and creative ways, as well as possibly providing evidence for why we need to continue to publish books we can hold in our hands, I have been bringing such books to class every Monday. This post is the second installment of some of books I have shared with them. Anne Carson’s Nox: Anne Carson’s brother died in 2000. She had not been in much contact with him for the last 22 years of his life. He had run away from home while still a teenager and she received a postcard from him now and then, a letter here and there. Her brother was troubled, was involved with drugs and the law. She found out about his death two weeks after he had died because his wife (third) had not been able to locate Carson’s phone number. His ashes were spilled into the sea. Nox is Carson’s dealing with her grief, not just for his death, but for a brother with whom she had never formed a relationship. Carson is a poet and teaches ancient Greek. She has written essays and translated ancient works. She has used Catullus’ poem on grief as a thread through this book, translating and defining each word. These definitions become a form of poetry itself as she stretches and pushes the words and connects them to her mourning. The students were seized with this idea. How could a 360 degree narrative work? I told them that I had actually created such a book. They were eager to see it. Austin Kleon’s Newspaper Blackout: Kleon has done what dada/ surrealist artists, whose hopes in the future and trust in the past were destroyed by the realities of World War I, first discovered. In their attempt to find some new meaning in the words that they had once put faith, they pulled words (frequently randomly) from pages of books to reveal new texts. In much the same way, and literally discovered as an exercise through writer’s block, Kleon transforms original newspaper stories into poetry using a black marker, sometimes riffing off the original, sometimes creating something totally new. The rich layers implicitly make the experience both visually and literarily compelling. We’ll be trying our hand at this as well. And thanks to you blog readers who continue to make terrific suggestions for books to share with my students. I continue to be grateful for the opportunity to expand my own expertise and knowledge of these books as well. The idea is that these books should somehow push the notion of what makes a book a book, that the structure and format, perhaps even content, of these books should somehow be unique and push boundaries of bookmaking and writing. 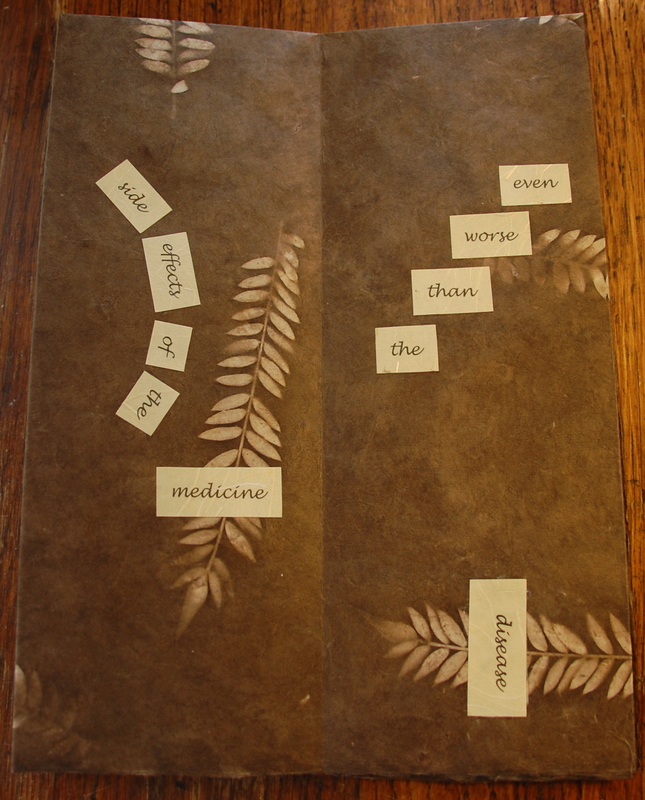 This entry was posted in books, death, Parkinson's, poetry and tagged accordion book, Anne carson, Austin Kleon, death, grief, Newspaper Blackout, Nox, Parkinson's, poems, poetry, World War I. Bookmark the permalink. When is a book more than a book? Perhaps the title of my presentation to your class? We’ll talk. Actually my first thought was what a beautiful and sad book you created about your mom! Thanks for the suggestion. I will definitely get this book and look forward to the foreword.